Great cricketers are usually best contemplated in the Test arenas in which their great deeds were done. But to appreciate George Headley it is probably better to visit a game at a club, in a park, on a village green or a maidan, looking for that incongruous presence, the really good cricketer in a field of modest triers. Everyone has watched or played with someone of the kind. He seems in sync with the game, understands it, and is a natural, compared with whom team-mates look ungainly. He usually goes in at No. 3 and bats all day, husbanding the strike. When he succeeds, his pals are in good heart. When occasionally he fails, victim of an outlandish catch or a bad call, they mount little further resistance. For a decade of Test cricket, this mantle was George Headley's. To evoke the batting burden he bore for West Indies, CB Fry famously dubbed him "Atlas". Actually the classical allusion isn't quite exact. Unlike the mythological Atlas, lumbered with a job he detested and hoodwinked by Hercules into taking it back, Headley never shirked his burden. But Fry might also have been recalling his Homer, who made Atlas father of Calypso. The complications of a role such as Headley's must be understood as being among the most formidable in cricket. Great players usually play in good teams: this is a reason they become great. They have the opportunity to bat with competent partners and in favourable circumstances, or to bowl with reliable back-up and alert fieldsmen. The lot of the outstanding player in a mediocre team is disproportionately harder, not merely because of the absence of able support and the likelihood of losing causes, but because the scenarios encountered tend, over time, to distort one's natural game. For a batsman, questions arise. Do you preserve your wicket at all costs in the hope of prolonging a game? Or do you risk all, knowing that time is short? In describing his own career, John Reid - whom John Arlott once described as "an Atlas-type figure of New Zealand cricket" - explains how you must, in a sense, ignore reality. "I told a lot of lies. We'd gather as a team and naturally I'd try to be as positive as possible... I'd try to encourage our fellows, to explain that everyone is human, that they all got nervous, had failures. But in the back of your mind there was this knowledge that, all things being equal, we were in for a rough time." Headley dawned, furthermore, ahead of cricket's institutional structures in the West Indies. His first series was in 1929-30, only two years after the foundation of the West Indies Cricket Board of Control. The region had no domestic competition, and administration was still radically decentralised: each venue had a different selection panel and a different captain; and there were 28 players in the four-Test rubber against England. Headley, 20, was the only Jamaican summoned for the Tests until Kingston hosted the last: not surprising, in view of his 703 runs at 87.9 during the series. For the next decade Headley was the first West Indian picked everywhere; the other 10 players were almost an irrelevance. In 19 pre-war Tests he made 26.9% of West Indian runs off the bat - a greater ratio than even Don Bradman, who made 26.5% of Australia's in his 37 pre-war Tests. Headley scored two-thirds (10 of 15) of all West Indian hundreds in his appearances; Bradman not quite half (21 of 46) of the Australian centuries in his. 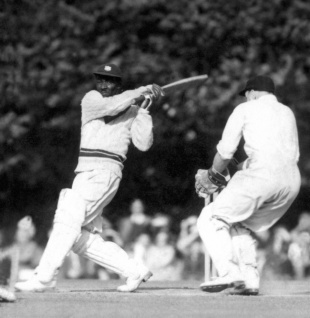 CLR James advanced Headley as "my candidate for a clinical study of a great batsman as a unique type of human being, both mentally and physically". When team-mates fell to foolish shots, Headley would simply ask, as if puzzled: "Why him don't like to bat?" For his own slight build, round shoulders and plod to the crease with bat dragged behind him belied a batting personality that was instinctively dominant. Team-mate Jeff Stollmeyer recalled that Headley was fond of smacking the first ball from a spinner straight back, trying to hurt their hands. "It was George's way of ensuring that spin bowlers did not give him much trouble," he said. Headley's placement was so precise, Learie Constantine remembered, that he would pick out fielders who were also bowlers, endeavouring to tire them. "Sometimes he places the ball with fiendish cunning, so close and tempting that the player strains a shade too much to make an impossible catch or stop a ball a foot beyond his outstretched finger tips; and then a muscle is pulled or an ankle dragged." At a time when West Indian cricketers were stereotyped as ebullient and ill-disciplined, Headley was also a pragmatist. He once recommended that West Indies bowl outside leg stump in order to deny India a Test victory; it worked. His record bespeaks uncommon drive and endurance. Headley's average at the outbreak of war was 66.7; among team-mates who played as many as five Tests, the next highest average was Clifford Roach's 30.7. West Indian captains in that period had contributed only five half-centuries - but they, of course, were white. Headley became, as former Jamaican Prime Minister Michael Manley put it, "black excellence personified in a white world and a white sport". He was proud of his Afro-Caribbean heritage, describing himself as "African" on the immigration form when he entered Australia for the 1930-31 tour. On seeing a photograph of a line of cricketers waiting to meet George VI, historian Frank Birbalsingh felt uplifted. "That one of us - a black man - could shake the hand of a king introduced possibilities formerly undreamt of in our colonial backwater of racial inferiority, psychological subordination and political powerlessness," he said. But being fit for kings did not, in the eyes of the West Indian board plantocracy, fit Headley himself for leadership. As Constantine wrote, "Cricket in the West Indies is the most glaring example of the black man being kept in his place... The heart of our cricket is rotted by racist politics. I only hope that before I die, I see a West Indian cricket team chosen on merit alone, and captained by a black man, win a rubber against England." Constantine almost had his wish in January 1948, when Noel Nethersole, deputy of Jamaica's People's National Party to Michael Manley's father Norman, agitated from within the West Indian board for Headley's recognition. But Headley's tenure was confined to the first Test against Gubby Allen's visiting Englishmen in 1947-48, a gesture reeking of political expediency. From the outside, Wally Hammond expressed bafflement: "Headley was by far the most outstanding player as well as the most experienced cricketer... and I do not see why he was not given unqualified control of the team for the whole series." From the inside, Clyde Walcott described widespread belief that the West Indian board, "while realising that he [Headley] was the right man for the job and not daring to usurp his rightful place on his home ground of Jamaica, felt much more confident of their powers in Trinidad and British Guiana". In the end, a back injury, which Headley sustained in the first Test, kept him from the last three Tests, and the captaincy settled on white John Goddard. Another 12 years elapsed before Frank Worrell's appointment fully enfranchised black West Indian cricketers - and by then, Worrell could call on immeasurably stronger XIs. Historian Hilary Beckles calls Headley "a saturnalia - a sign of things to come". Like the epithet Atlas, this is both apt and not quite apt: great cricketers would indeed follow in Headley's footsteps, but none would again have to bear the responsibility of being their team's first, best and only hope.